The Owl B1 EasyCast Mini Gel System is the perfect small device. Run from 5 to 34 samples in this functional system. The unit is economical enough for every researcher to have one at their workstation. The durability and ease of use makes this the perfect choice for students and high volume researchers. 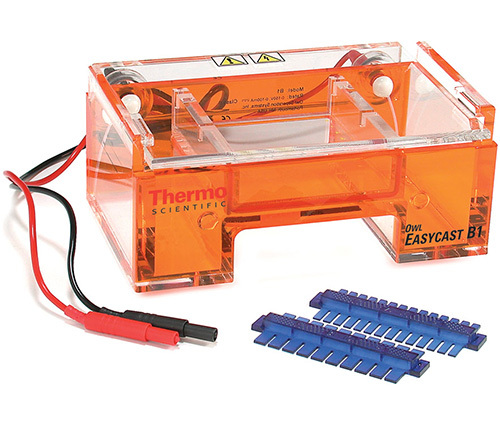 Ships complete with Buffer Chamber, SuperSafe Lid with Attached Power Supply Leads, EasyCast Gasketed U.V. Transmissible (UVT) Gel Tray, 2 Combs: 10 and 14 Well, Double Sided, 1.0/1.5 mm Thick. The 2 comb slots on the U.V. transmissible (UVT) gel tray double your sample capacity by doubling the number of sample wells. Part Number B1-CST. Please note that trays are not included.